Clarion Books, 2018. First published in the Netherlands in 2014. 32 pages. This book was first published in the Netherlands in 2014. It is not eligible for the Newbery. I should not have taken time to read it. On top of that, I have a pet peeve against books that show someone knitting a complete sweater in less than a month – and this book does much, much worse than that. And yet, all that said — I did read this book today and was enchanted. The speedy knitting is all part of this amazing goat’s magic. Greta is a goat, a white goat. When she goes outdoors in wintertime, she’s almost invisible. She is a very, very good knitter. She knits socks for everyone she knows and for many she doesn’t know. Today Greta decides to knit something different. How about a whole goat? She tries a little one first. Click, click, clickety click go her knitting needles, and before long a little goat slides off her needle. What fun! Greta knits more little goats so they can play together. The illustration here shows several goats, with splashes of color in various places and trailing yarn. They are cavorting about happily, with two butting heads. But then “mean Mrs. Sheep” comes by and badmouths Greta’s knitting. Greta is upset. She isn’t watching her knitting. We’ll see who knits the fastest, Greta thinks angrily. Clickclickclicketyclick go her needles. Mrs. Sheep keeps talking. Greta still isn’t watching her knitting. She decides it’s finished and ends it off . . .
. . . and a wolf jumps off the needle! The little goats run away. Well, the wolf deals with Mrs. Sheep. Greta hides just in time – in a closet with more yarn, thankfully. Because next she knits a tiger to catch the wolf. But the tiger is hungry…. And what is especially lovely about this book is how it all comes together – or, um, apart – at the end. (No one is permanently damaged, but Mrs. Sheep does learn a lesson.) Though Greta does need to learn to pay more attention to what she knits! So this knitter, for one, truly appreciates the genius of Greta, whose knitting is just plain magical. Besides this being a really fun story to tell, all the better to convince children that knitters have magical powers, right? 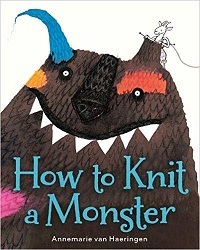 This entry was posted on Monday, November 5th, 2018 at 11:43 pm and is filed under Animal Characters, Delightfully Silly, Fantasy, Knitting, Picture Book Review, Starred Review. You can follow any responses to this entry through the RSS 2.0 feed. You can leave a response, or trackback from your own site.